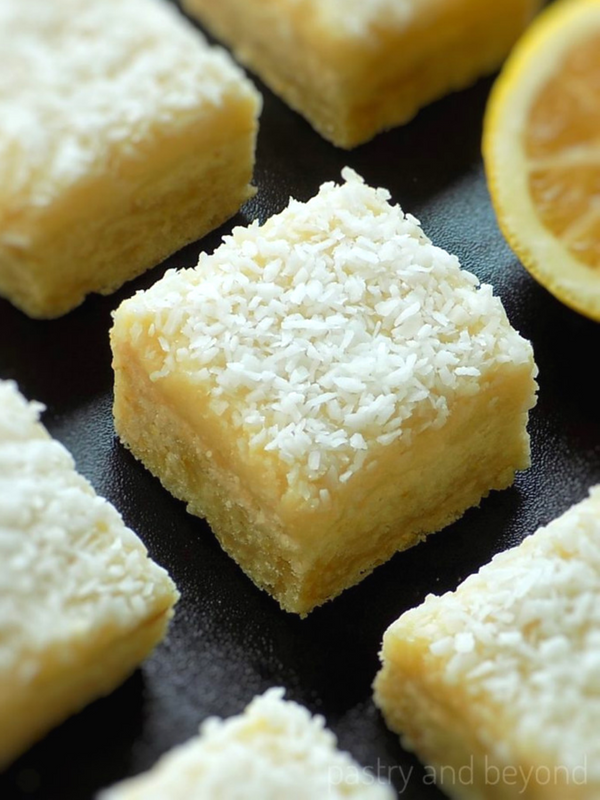 These lemon coconut bars are rich and delicious with white chocolate! 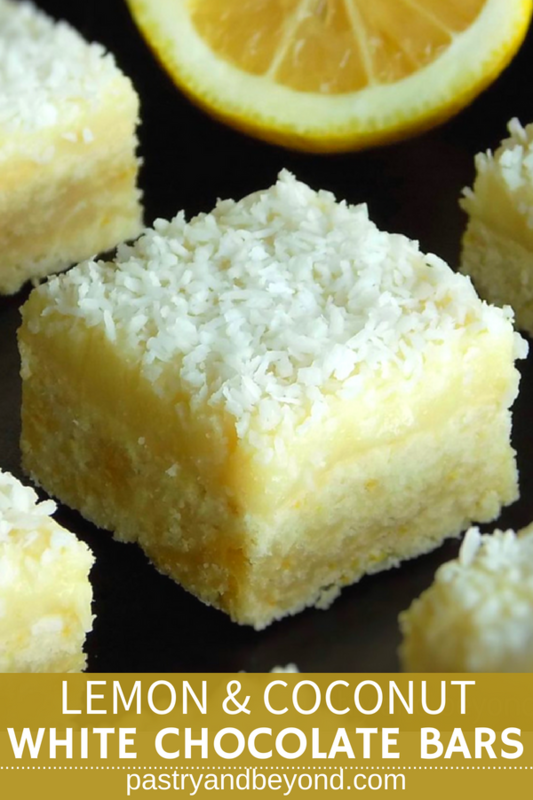 This is a very easy recipe for lemon coconut bars. No mixer needed! I love lemon and white chocolate together. 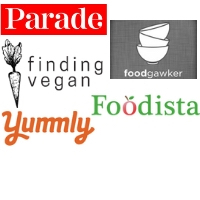 I decide to use them together in a recipe with coconut! 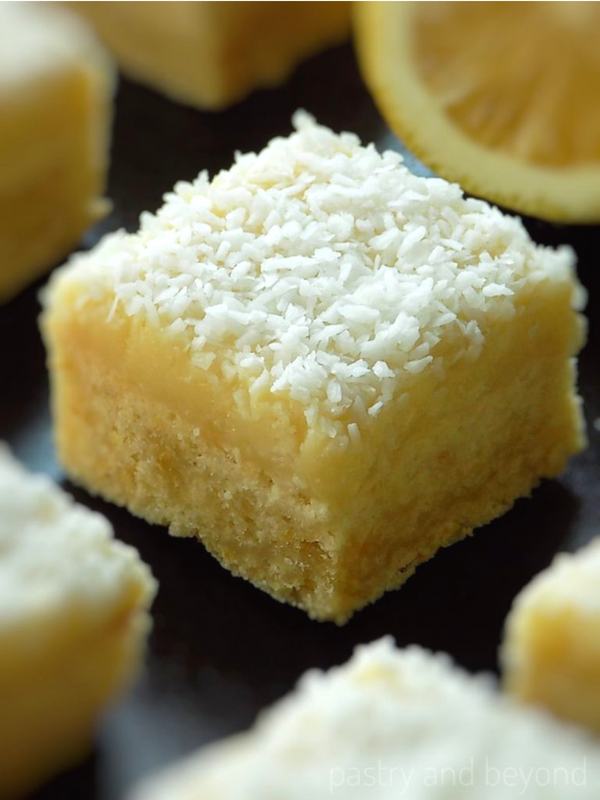 Today I share my soft lemon coconut bars with white chocolate ganache. I make a lemon crust which balances the sweetness of the white ganache. 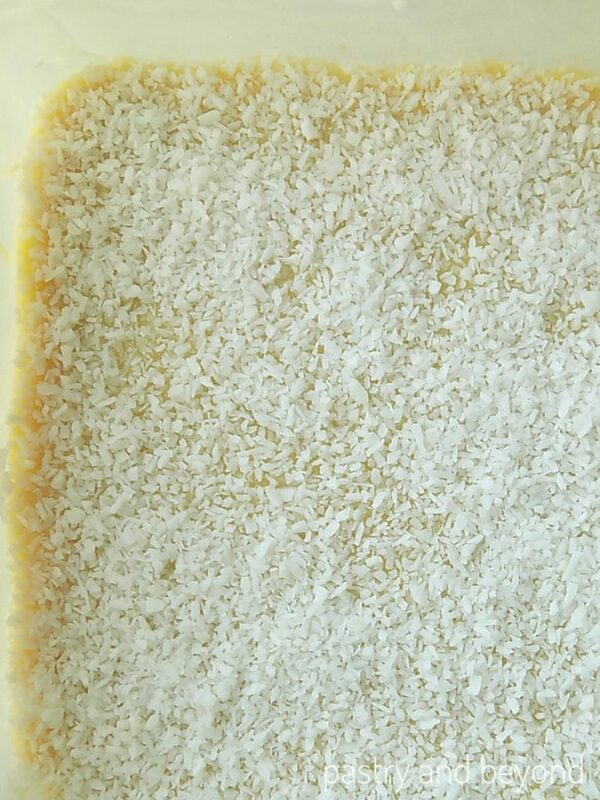 I cover the top with desiccated coconut which enriches these bars and gives the summer feeling(with the first bite that’s how I feel). 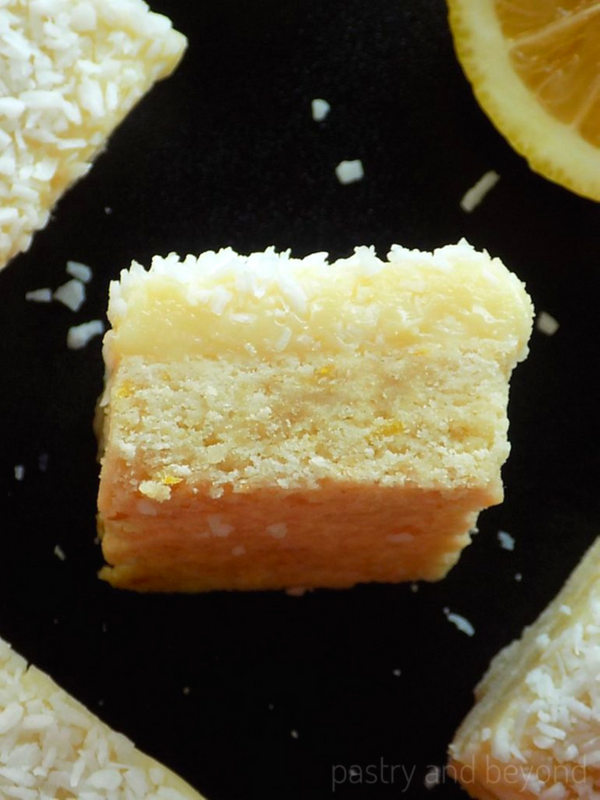 If you like lemon, white chocolate and coconut, I am sure you will love these bars. 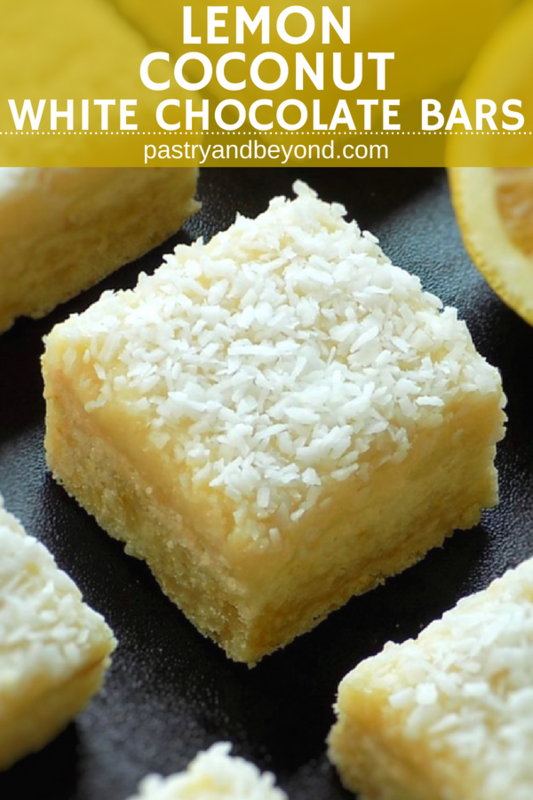 Lemon crust, filled with silky, creamy ganache and topped with desiccated coconut make these bars rich in flavor and very delicious. I make a thick crust with little sugar to balance the sweetness. I use 1:2 ratio by weight for this recipe as a filling. 1 part cream to 2 parts white chocolate. If I was using semisweet chocolate I would use 1:1 ratio. 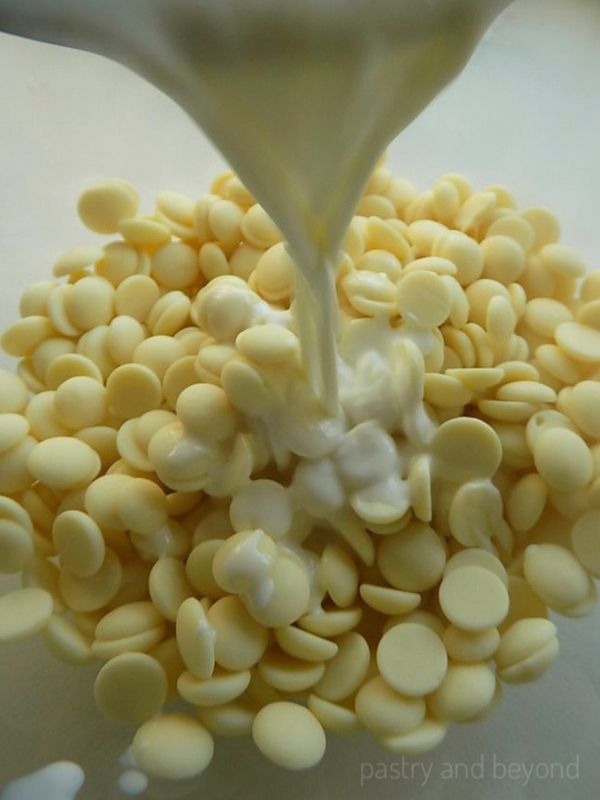 However, you need less cream for white chocolate because of the cocoa butter. When I frost a cake, I use 1:3 ratio to make a white chocolate ganache. 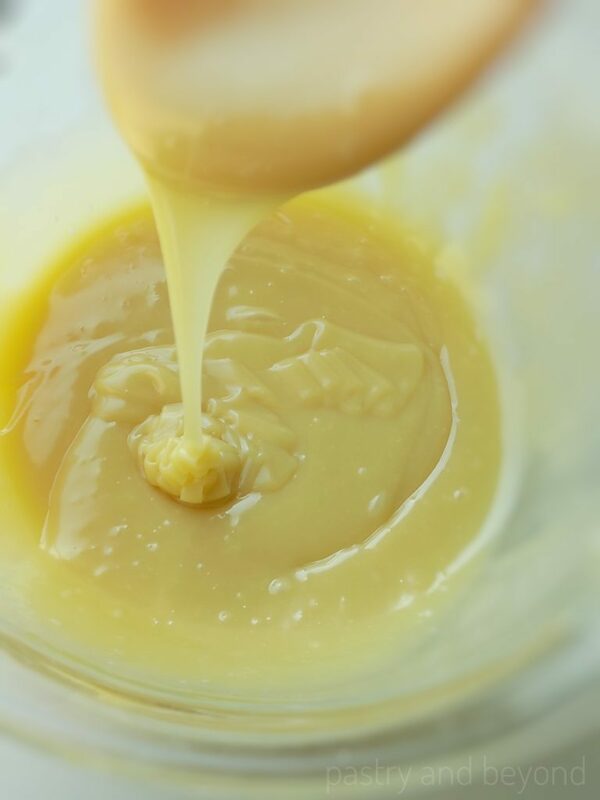 1 part cream to 3 parts white chocolate. Let’s go through the stages. First I grease my oven-proof square dish and line the bottom and sides with parchment paper. This makes it easier to remove the uncut bars from the dish. The sides of the parchment paper overhang from the sides so I can lift it from the sides when it is time to remove the uncut bars from the dish. I set aside the dish. Then I place the lemon and sugar in a big bowl and mix to increase the lemon flavor. You can use a fork to mix the mixture or rub with your fingers to bring the lemon flavor out. Next, I add the flour and mix until all combined. Later, I add the cubed butter and rub with my fingers until the mixture resembles crumbs. If you want you can use a fork but fingers make it faster. Finally, I add the lemon juice and mix with a spatula. I transfer the dough into the square dish. Then I spread the dough evenly. You can use your hands or a spoon to spread it. I bake for almost 30 minutes until the edges are brown and the top is lightly brown. I remove the dish from the oven and set aside. While the crust is cooling, I start to make the ganache. It is very easy! First, I place the white callets in a medium heat-proof bowl. If you want, you can use chopped white chocolate. I keep the bowl aside. Then I put the heavy cream in a small pan and place it over med-low heat. When the heavy cream scalds-small bubbles appear at the sides of the pan, I take the pan from the heat and pour onto white chocolate. I wait for almost 20 seconds without stirring to let the cream soften and melt the chocolate. After that, I gently stir the mixture with my spatula. It has to be a smooth ganache without any chocolate pieces inside. If there are some white chocolate pieces in your ganache, you can place it in the turned off oven- that is still warm as you just baked the crust-for almost 1-3 minutes depending on the unmelted chocolate pieces and stir until you have a smooth ganache. It will be cooled in 20-25 minutes. When the crust and ganache are cool enough(not hot but not necessarily totally cooled)-it takes almost 1 hour in total, I pour the ganache over the dough. Then I cover the top with desiccated coconut. I leave the dish at room temperature for almost 1 hour until it is cool. Later, I keep the cool dish in the freezer for almost 1 hour until the ganache sets. Make sure that the dish is totally cool before you place it in the freezer. Alternatively, you can keep it in the fridge for longer. Finally, I remove the dish from the freezer. I lift the parchment paper from the sides to remove the uncut bars from the dish. I cut them into 16 squares. 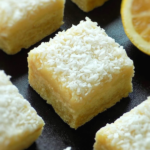 Enjoy these lemon coconut bars with white chocolate! Rubbing the lemon zest and sugar brings the lemon flavor out. If you see white chocolate pieces in your ganache, place the bowl into the oven that is still warm(you just baked the crust!). After 2-3 minutes or more-depending on the size of the pieces, remove it from the oven and start stirring. The pieces will easily melt. If they are not melted, it means that you should keep in the oven longer. You should store these bars in the fridge. 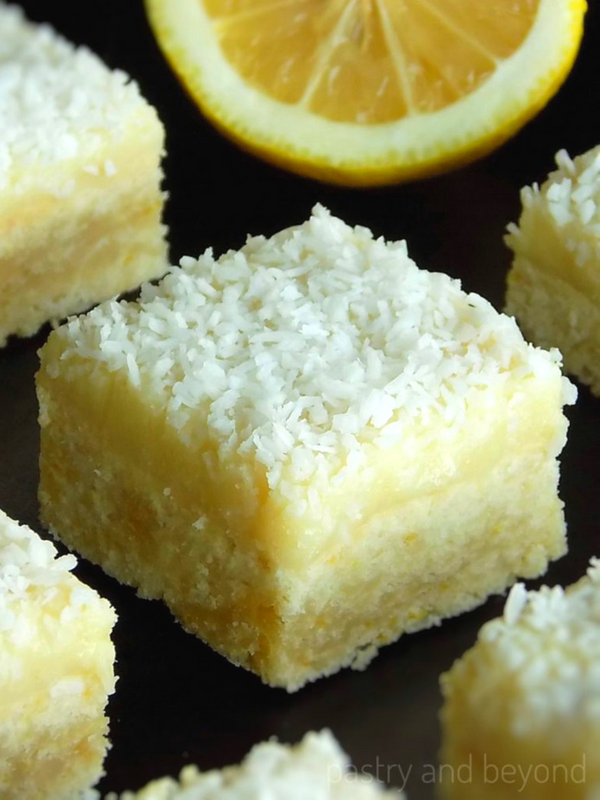 Lemon coconut bars are rich and delicious. Lemon crust balances the sweetness of the white chocolate. Coconut enriches these bars. Preheat the oven to 325°F(165C°). 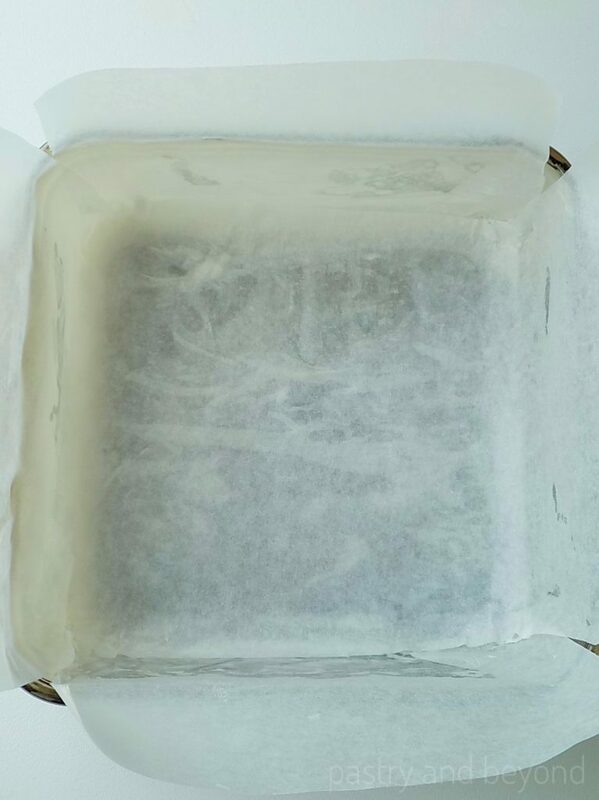 Grease 8 inch (20cm) square oven-proof dish and line the bottom and sides with parchment paper, about 2 inches(5 cm) of overhang on each side. Dough: Put the sugar and lemon zest in a big bowl and mix with a fork or rub with your fingers to increase the lemon flavor. Add in the flour and mix well. 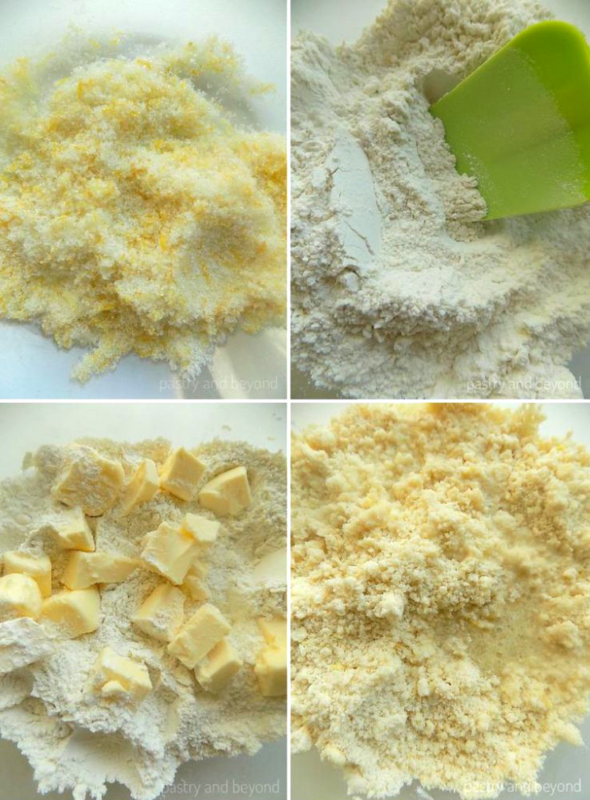 Add the cubed butter and rub them with your fingers or use a fork until the mixture resembles crumbs. Add in the lemon juice and stir with a spatula. Transfer the dough into the square dish and spread it evenly with your fingers or with a spoon. Bake for almost 30 minutes until the edges are brown and the top is lightly brown. Let the crust cool in the dish on a wire rack. Assemble: When the crust and ganache are cooled(it takes almost 1 hour in total-crust will be cool in 1 hour and ganache will be cool enough in almost 20 minutes while crust is cooling), pour the ganache over the dough. Then cover the top with desiccated coconut. Let it cool for 1 hour at room temperature. Then keep the dish in the freezer for almost 1 hour until the ganache sets. Alternatively, you can keep in the fridge for longer. Make sure the dish is totally cool before you place it in the freezer or in the fridge. Remove the dish from the freezer. Lift the parchment paper from the sides to remove the uncut bars from the dish. Cut them into 16 squares and enjoy! You can keep in the fridge for almost 4 days. Update Notes: I originally shared this post on April 14, 2017. I republish it today with extra information and new photos.